Gene's Scrolling and Fret Work in Nora Springs, IA for woodworking. Hello and Welcome to my website. My name is Gene Jamtgaard. I started Gene’s Scrolling and Fret Work in 1999 in Nora Springs, Iowa. I bought my first scrollsaw, Delta Milwaukee Homecraft 16”, Rockwell Mfg. (made in 1955 of which I still have), back in the early 1960’s. I scrolled out a couple small projects and did not do any scrolling again until I started Custom Scrolling Only in 1999. I focus mainly on scrolling portraits of people, but you will notice here on my website I also do plaques, desk name plates, scenes in slabs of wood and many other items. I am a Charter Member of the Scrollsaw Association of the World (S.A.W.). S.A.W. held a Conference in Cedar Rapids, Iowa in April, 2000 where I entered a Lineman Plaque and received a Red Ribbon in the Adult Original Division. 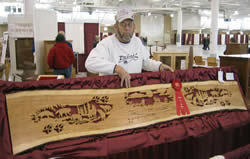 In November, 2004 at a wood workers show held in Des Moines, Iowa, I entered an eight (8) foot cherry slab (1 solid piece) with three (3) wolf scenes scrolled in it. I received a Red Ribbon for that and I also had entered five (5) portraits and received a White Ribbon in the Scrollsaw Division. In August 2006 at the Midwest Scrollsaw Trade Show held in Richland Center, WI, I entered a deer scene cut out in a piece of maple burl and received a Blue Ribbon. Hope you enjoy what you see here on this website. For Custom Orders, please contact me at wdwkr@centurytel.net for further information as some projects are more time consuming than others.